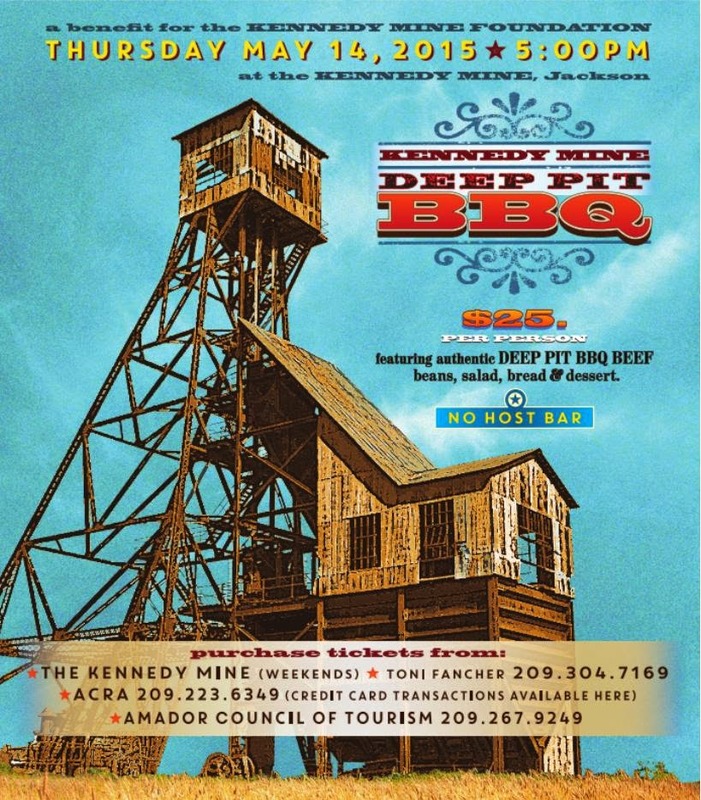 Sutter Creek, CA – On Saturday May 9, 2015 the Native Sons of the Golden West, Parlor 17 sponsored and hosted the 1st Annual Shrimp Feed benefiting the Sutter Creek Community Benefit Foundation. The sold out crowd feasted on salad, pesto, and pounds upon pounds of succulent shrimp. Attendees (mainly locals) enjoyed a cocktail hour in the historic Native Sons bar, a silent auction and vigorous live dessert auction. The Native Sons’ generously sponsored the dinner allowing all the proceeds from the event ($8,000) to go directly to SCCBF to support the South Main Street Mining Display and Park. This critical contribution is above and beyond the $10,000 cash Parlor 17 has already pledged to the project. The partnership between Native Sons and SCCBF has brought about a point where substantial progress on the South Main Park will be made in the coming months. To mark these milestones an official groundbreaking will be held June 1, 2015 at 5:00pm. At this groundbreaking ceremony the results of the Name the Park Contest will be unveiled. Construction of the foundations for the stamp mill and compressor will begin following the groundbreaking. 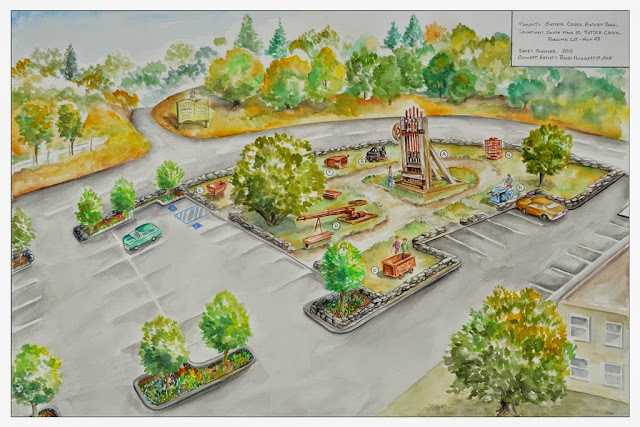 Due to a generous contribution from Sutter Creek Lions Club, donations from local individuals and businesses and the continued fundraising efforts of SCCBF look forward to continued progress on the South Main Park, Sutter Creek Grammar School and future projects to preserve and restore Sutter Creek’s historic assets. For information on becoming a part of SCCBF visit www.sccbf.org. To learn more about the South Main Park and SCCBF please visit www.sccbf.org or contact (209) 560-6880. 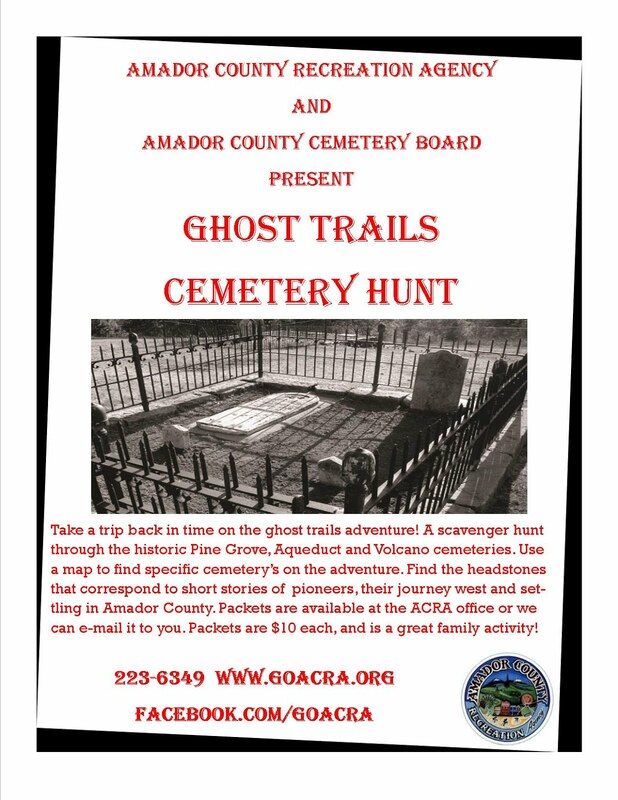 Kat Everitt, Den McCue and I--as three folks who enjoy exploring local history--recently visited the Amador County Archives to learn what it means to have historical archives and a place to store them. It was also important to learn how they are used--and what their use may be, for all county citizens--especially including our young students. During our visit, located in a modern building with ample parking on Airport Road in Martell, Teresa Guidi graciously led us on our journey as we explored "What Are the County Archives All About?" Teresa is the Manager of the Records/Archives Division of the Amador County Human Resources Department. Among her other staff responsibilities for the county, Teresa is responsible for archiving--that is, storing and preserving for official and citizen use, the historical primary source papers; diaries; journals, maps, photographs; relevant newsprint; magazines; illustrative images; records of mines and mining accidents; coroners' inquests--materials that can be stored safely in boxes and files. These are all public records. Primary source material from the archives is requested by historians, government agencies, students of history, interested public, writers doing research for novels and articles…all are served. For example, Teresa explained to us how the U.S. Environmental Protection Agency recently researched maps and construction documents at the Archives for their work related to mine tailings clean-up in the County. The heart of the archiving work is a process called "Accession." "Accession" is the actual filing of these 'paper' materials, and cataloging them all online. We saw two rooms of amazing row after row of boxes of accessioned materials--all kept at the proper temperatures, humidity, and fire-safe conditions critically important to preserving the history of a county. Another room houses boxes and boxes of county records. At present, there are one hundred file boxes of materials that still need to be “accessioned.” Hundreds have been stored over the years, of course…all since the 1850s. It's estimated that around 80% of all the historic materials that have been given to the Archives are accessioned and available for use, but new historical materials are constantly brought to the Archives to store--and are welcomed. The Archives receives an annual budget of $15,000, which does not include staff time. Theresa is the only paid county staff assigned to the archiving work, and she splits her hours between archiving, managing the records for all county offices, and supervising the approximately 200 volunteers who serve in these departments. As a result, the County’s archiving work relies heavily on the contribution of dedicated volunteers. Teresa made it clear, that in addition to the availability of volunteers for archiving work, outreach to the community—people will learn about and access the archive for the viability of the archival process. The archives are located at 12200-A Airport Rd. Jackson, CA 95642. Their hours are on Monday (only) from 10 am to 3 pm and appointments are highly encouraged.